1887 Indian head penny value is over $2 if your coin was fortunate and avoided excessive wear and/or damage. Pennies from the 1880s are less common than later years and finding one in nice condition puts into the scare category. Most of these coins became worn completely smooth. Collectors and dealers are well aware of the poor condition affecting the majority of 1887 pennies. Hopefully your coin shows details in the center parts of the feathers, confirming a better quality and higher value. 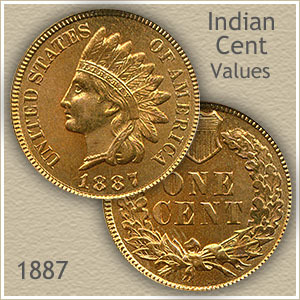 Old Indian pennies without the common damages found on these coins are given higher values. Bent coins are avoided by collectors, scratches and noticeable rim nicks also lower values. Copper is quick to discolor and turn brown, uneven color and very dark pieces trade at lesser prices. Also, today’s preference among dealers and collectors is not to clean copper coins. Value of your 1887 penny is determined by the amount of metal removed from the coin due to wear and any adverse damage to the surfaces. Most old coins are either very worn or damaged in someway. 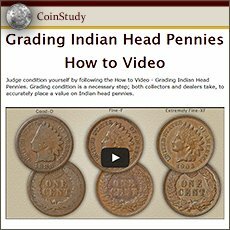 Gem quality Indian pennies are very rare, however a few are known and there are collectors avidly seeking them. When offered for sale, top prices are paid. 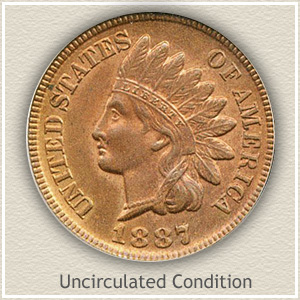 Pictured is one of the rare 1887 Indian pennies surviving today having avoided all hazards that could lower its value. Placed in a David Lawrence rare coin auction, the coin attracted serious collectors. Bidding took the final price to $345. Deserving of strong value this 1887 penny never circulated leaving the surfaces free of wear, marks and nicks. Avoiding exposure to the air and elements allowed the original luster to remain bright. Rarely does a coin combine pleasing eye appeal with like new condition. 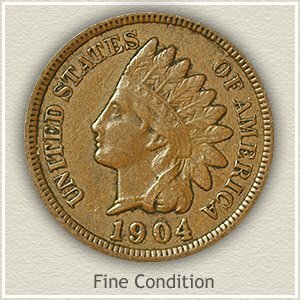 Your coin may be part of the elite few of well preserved Indian pennies, always worth a second look. Evident in today’s 1887 Indian head penny value, few of these old pennies remain in above average condition. Wear and damage has reduced the value of many. 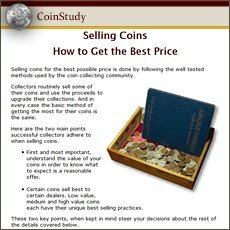 Closely examine and judge the "grade" and value category of your coin by comparing it to the images and descriptions. Uncirculated: Shortly after minting this 1887 penny it was put away in brand new condition and never used. No wear shows on the highest parts of the design. Check the Indian‘s cheek, hair and ribbon below her ear and the tips of the feathers. If there is any wear, these areas show a smoothing to the surface and the original luster is disturbed. Extremely Fine: Small and subtle details often separate a slightly better $20 coin from a not quite as nice $10 example. An Indian penny in "extremely fine" condition is noticeably bold in appearance with just slight wear. Evident is a slight flattening to the key elements of the design, the cheek below her eye, and the ribbon trailing below her headdress. Fine: As these old pennies begin to show moderate wear its grade is termed "fine." Feathers once finely detailed are now smooth at the ends and worn in the centers. Hair curls are no longer rounded in appearance with parts blending into the headband. Below the ear and behind her neck the headdress ribbon and hair is lacking detail and separation. Good: Worn to a shallow relief with little detail remaining describes a coin in "good" condition. The area surrounding the eye is only slightly defined. A separation of chin and neck is slight. Feathers and headdress details are worn smooth showing just an outline. Although the lettering and date are heavily worn they should be separated from the rim. 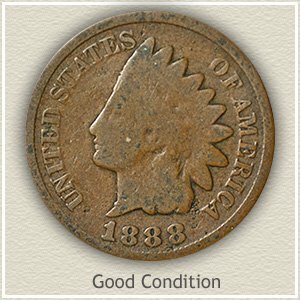 Your 1887 Indian head penny value may be at the low end, however if damage free, it remains a popular collectible. $1 to 2 dollars for common dates. With many advanced collectors pursuing Indian pennies the rare dates along with your 1887 Indian head penny value are moving higher. As always better condition coins are especially sought. Today your box of old coins has never been as valuable.